I have little space available on my hard drive, so I bought an external (USB) drive for photo storage, a little slow but it does its job: I download photos from my camera, review them, delete those defective, select a few to resize and publish on web and once in awhile copy the photos to the external drive and delete them from my desktop, to make room for more downloads from the camera (yes, I know I am stupid for not having a backup, but until now I escaped the consequences of that). Well, it seems my process is prone to human error and that just happened: the huge majority of the photos taken this year in May are gone (thousands of photos). Most likely I got confused in the directory structure and delete some folders before making the much needed copy first. Alex suggested PhotoRec (packaged in fedora as part of testdisk) and despite my skepticism I gave it a try (the PC had nothing better to do overnight anyway) and, as expected, it recovered almost nothing (images in the Firefox cache from a couple of years ago are useless): if you have ~30GB of free space, download photos, delete them, download another, delete and so on, the task is impossible (but the tool is powerful). In a somewhat similar situation other people had a more energetic approach and started writing photo management software but I show the national spirit, get totally bummed and observe: "life is NOT a pony farm". You can get your disk to companies like OnTrack. 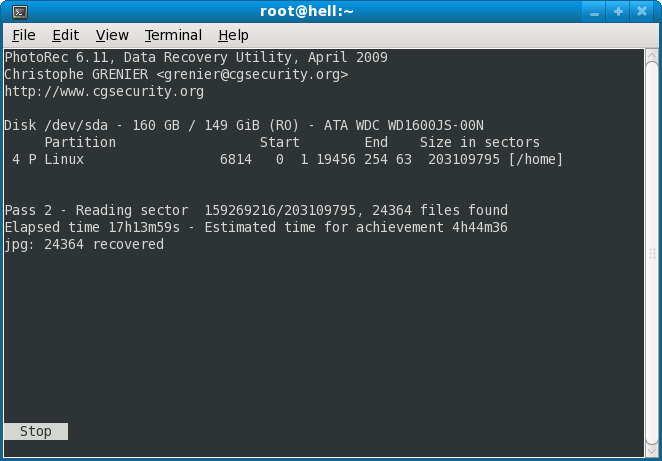 They can recover the data even if it has been overwritten multiple times. But it costs money of course.